Register your presence in the Ebonheart Pact's capital. You have an audience with the Sacred Lady. I arrived in Mournhold, the capital city of the Ebonheart Pact. 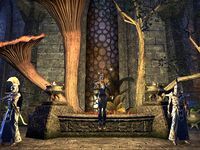 As the seat of Dunmer power, it is home to the Tribunal Temple. Due to recent events, the city is bustling with visitors. Talk to Ordinator who tells you to go register with Registrar Riivel at the City Center. Talk to Naryu Virian outside the Tribunal Temple. Talk to Naryu Virian in the Flaming Nix. Steal the key from the courier. Investigate the House Dres Farmstead. Talk to any of the Ordinators in Mournhold. They will tell you to speak with Registrar Riivel next to the City Center. Everyone who enters the city must be registered. The Tribunal Temple has been expecting you. Almalexia wants to see you as soon as possible. You go to the Tribunal Temple and see Naryu Virian standing outside. She says there is trouble brewing. The Maulborn are in Mournhold. While you tell Almalexia about the Maulborn, she will try to find out where the Maulborn are hiding. Once you are done talking to Almalexia, you should meet Naryu in the Flaming Nix, a cornerclub south of the temple. Inside the temple, Almalexia rewards you with Almalexia's Enchanted Lantern. She allows you to investigate the Maulborn in Mournhold. Naryu Virian is leaning against the wall in the cornerclub. She saw the House Dres farm outside the city was on high alert. They are using a courier named Thauravil to deliver bribes to the other house leaders and city officials. She suggests taking the courier's key. He picks up bottles of wine at the cornerclub. She wants you to slip a sleeping poison into the wine, follow him and take the key when he falls asleep. You can persuade Naryu. The wine is in the lower level of the Flaming Nix on some crates. After the wine is poisoned, return to Naryu. The courier runs out of the cornerclub. If he detects you when you are following him, speak to Naryu again, and the courier will come back for more wine. The merchant falls asleep behind the stables. This is close to the House Dres Farm map marker, and there are some guar in and around the stables. Take his key and go to House Dres Farmstead. Inside Sathram House there is a suspicious rug. Moving it reveals a door to the Mournhold Underground. Naryu Virian enters the house after you discover this. "Welcome to Mournhold, capital city of the Ebonheart Pact. We track all visitors. Upon arrival, everyone must see a registrar, who will record your name and business in Mournhold. Thank you for your cooperation." "Deshaan has become a chaotic, dangerous place. Why shouldn't we instill a degree of order in our most-prominent city? A little inconvenience is a small price to pay for your continued safety, citizen." Where can I find a registrar? "Speak with Registrar Riivel, in the city center. Take the stairs up to the central building and you should find him in the courtyard there. Do not dally. It is illegal to enter Mournhold without being registered."